Medial epicondylitis accounts for only 10-20% of all epicondylitis diagnoses  ; the annual incidence is between 3-4 per 10,000 patients in the United States and more common in patients aged 40 years and older  . The condition is classically described in the dominant elbow of a golfer. Tennis players who hit their forehand with a heavy topspin are also at increased risk for developing medial epicondylitis. The medial epicondyle is the common origin of the forearm flexor and pronator muscles. The most common site of pathology is the interface between the pronator teres and the flexor carpi radialis origins. [6, 7] The flexor pronator muscle group serves as a secondary stabilizer of the medial elbow, assisting the ulnar collateral ligament (UCL). Jayanthi N, Esser S. Racket sports. Curr Sports Med Rep. 2013 Sep-Oct. 12(5):329-36. [Medline]. Kiel J, Kaiser K. Golfers Elbow. StatPearls [Internet]. 2018 Jan. [Medline]. [Full Text]. Kohn HS. Prevention and treatment of elbow injuries in golf. Clin Sports Med. 1996 Jan. 15(1):65-83. [Medline]. Nirschl RP. Prevention and treatment of elbow and shoulder injuries in the tennis player. Clin Sports Med. 1988 Apr. 7(2):289-308. [Medline]. Nirshal RP. Muscle and tendon trauma: tennis elbow. The Elbow and Its Disorders. Philadelphia, Pa: WB Saunders Co; 1993. 481-96. Kraushaar BS, Nirschl RP. Tendinosis of the elbow (tennis elbow). Clinical features and findings of histological, immunohistochemical, and electron microscopy studies. J Bone Joint Surg Am. 1999 Feb. 81(2):259-78. [Medline]. [Full Text]. Ljung BO, Forsgren S, Fridén J. Substance P and calcitonin gene-related peptide expression at the extensor carpi radialis brevis muscle origin: implications for the etiology of tennis elbow. J Orthop Res. 1999 Jul. 17(4):554-9. [Medline]. Hannah GA, Whiteside JA. The elbow in athletics. Sports Medicine Secrets. Philadelphia, Pa: Hanley & Belfus; 1994. 249-55. Vicenzino B, Brooksbank J, Minto J, Offord S, Paungmali A. Initial effects of elbow taping on pain-free grip strength and pressure pain threshold. J Orthop Sports Phys Ther. 2003 Jul. 33(7):400-7. [Medline]. Assendelft WJ, Hay EM, Adshead R, Bouter LM. Corticosteroid injections for lateral epicondylitis: a systematic overview. Br J Gen Pract. 1996 Apr. 46(405):209-16. [Medline]. [Full Text]. Klaiman MD, Shrader JA, Danoff JV, et al. Phonophoresis versus ultrasound in the treatment of common musculoskeletal conditions. Med Sci Sports Exerc. 1998 Sep. 30(9):1349-55. [Medline]. Baskurt F, Ozcan A, Algun C. Comparison of effects of phonophoresis and iontophoresis of naproxen in the treatment of lateral epicondylitis. Clin Rehabil. 2003 Feb. 17(1):96-100. [Medline]. Nirschl RP, Rodin DM, Ochiai DH, Maartmann-Moe C, and the DEX-AHE-01-99 Study Group. Iontophoretic administration of dexamethasone sodium phosphate for acute epicondylitis. A randomized, double-blinded, placebo-controlled study. Am J Sports Med. 2003 Mar-Apr. 31(2):189-95. [Medline]. Hoogvliet P, Randsdorp MS, Dingemanse R, Koes BW, Huisstede BM. Does effectiveness of exercise therapy and mobilisation techniques offer guidance for the treatment of lateral and medial epicondylitis? A systematic review. Br J Sports Med. 2013 Nov. 47(17):1112-9. [Medline]. Burnham R, Gregg R, Healy P, Steadward R. The effectiveness of topical diclofenac for lateral epicondylitis. Clin J Sport Med. 1998 Apr. 8(2):78-81. [Medline]. Labelle H, Guibert R. Efficacy of diclofenac in lateral epicondylitis of the elbow also treated with immobilization. The University of Montreal Orthopaedic Research Group. Arch Fam Med. 1997 May-Jun. 6(3):257-62. [Medline]. Quillen WS, Magee DJ, Zachazewski JE. The process of athletic injury and rehabilitation. Athletic Injuries and Rehabilitation. Philadelphia, Pa: WB Saunders Co; 1996. 3-8. Thurston AJ. Conservative and surgical treatment of tennis elbow: a study of outcome. Aust N Z J Surg. 1998 Aug. 68(8):568-72. [Medline]. Verhaar JA, Walenkamp GH, van Mameren H, et al. Local corticosteroid injection versus Cyriax-type physiotherapy for tennis elbow. J Bone Joint Surg Br. 1996 Jan. 78(1):128-32. [Medline]. Foster ZJ, Voss TT, Hatch J, Frimodig A. Corticosteroid Injections for Common Musculoskeletal Conditions. Am Fam Physician. 2015 Oct 15. 92 (8):694-9. [Medline]. Pfenninger JL. Joint and soft tissue aspiration and injection. Procedures for Primary Care Physicians. St Louis, Mo: Mosby; 1994. 1036-54. Suresh SP, Ali KE, Jones H, Connell DA. Medial epicondylitis: is ultrasound guided autologous blood injection an effective treatment?. Br J Sports Med. 2006 Nov. 40(11):935-9; discussion 939. [Medline]. Connell DA, Ali KE, Ahmad M, et al. Ultrasound-guided autologous blood injection for tennis elbow. Skeletal Radiol. 2006 Jun. 35(6):371-7. [Medline]. Peerbooms JC, Sluimer J, Bruijn DJ, Gosens T. Positive effect of an autologous platelet concentrate in lateral epicondylitis in a double-blind randomized controlled trial: platelet-rich plasma versus corticosteroid injection with a 1-year follow-up. Am J Sports Med. 2010 Feb. 38(2):255-62. [Medline]. Mishra AK, Skrepnik NV, Edwards SG, Jones GL, Sampson S, Vermillion DA. Efficacy of Platelet-Rich Plasma for Chronic Tennis Elbow: A Double-Blind, Prospective, Multicenter, Randomized Controlled Trial of 230 Patients. Am J Sports Med. 2013 Dec 12. [Medline]. Keizer SB, Rutten HP, Pilot P, et al. Botulinum toxin injection versus surgical treatment for tennis elbow: a randomized pilot study. Clin Orthop Relat Res. 2002 Aug. 401:125-31. [Medline]. Rompe JD, Hope C, Küllmer K, Heine J, Bürger R. Analgesic effect of extracorporeal shock-wave therapy on chronic tennis elbow. J Bone Joint Surg Br. 1996 Mar. 78(2):233-7. [Medline]. [Full Text]. Speed CA, Nichols D, Richards C, et al. Extracorporeal shock wave therapy for lateral epicondylitis--a double blind randomised controlled trial. J Orthop Res. 2002 Sep. 20(5):895-8. [Medline]. Haake M, König IR, Decker T, et al. Extracorporeal shock wave therapy in the treatment of lateral epicondylitis : a randomized multicenter trial. J Bone Joint Surg Am. 2002 Nov. 84-A(11):1982-91. [Medline]. Melikyan EY, Shahin E, Miles J, Bainbridge LC. Extracorporeal shock-wave treatment for tennis elbow. A randomised double-blind study. J Bone Joint Surg Br. 2003 Aug. 85(6):852-5. [Medline]. Chung B, Wiley JP. Effectiveness of extracorporeal shock wave therapy in the treatment of previously untreated lateral epicondylitis: a randomized controlled trial. Am J Sports Med. 2004 Oct-Nov. 32(7):1660-7. [Medline]. Mehra A, Zaman T, Jenkin AI. The use of a mobile lithotripter in the treatment of tennis elbow and plantar fasciitis. Surgeon. 2003 Oct. 1(5):290-2. [Medline]. Steunebrink M, Zwerver J, Brandsema R, Groenenboom P, van den Akker-Scheek I, Weir A. Topical glyceryl trinitrate treatment of chronic patellar tendinopathy: a randomised, double-blind, placebo-controlled clinical trial. Br J Sports Med. 2013 Jan. 47(1):34-9. [Medline]. [Full Text]. Gambito ED, Gonzalez-Suarez CB, Oquiñena TI, Agbayani RB. Evidence on the effectiveness of topical nitroglycerin in the treatment of tendinopathies: a systematic review and meta-analysis. Arch Phys Med Rehabil. 2010 Aug. 91(8):1291-305. [Medline]. Ciccotti MC, Schwartz MA, Ciccotti MG. 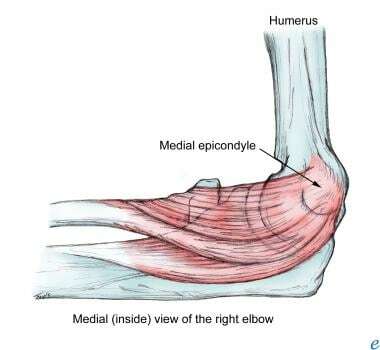 Diagnosis and treatment of medial epicondylitis of the elbow. Clin Sports Med. 2004 Oct. 23(4):693-705, xi. [Medline]. Wang AA, Whitaker E, Hutchinson DT, Coleman DA. Pain levels after injection of corticosteroid to hand and elbow. Am J Orthop. 2003 Aug. 32(8):383-5. [Medline]. Wiggins AJ, Cancienne JM, Camp CL, Degen RM, Altchek DW, Dines JS, et al. Disease Burden of Medial Epicondylitis in the USA Is Increasing: An Analysis of 19,856 Patients From 2007 to 2014. HSS Journal. 2018 Oct. 14:233-237. [Medline].